Only Portuguese products is what you will find here. Home-made pastries, sweets and salads, and different kinds of drinks like the ‘Ucal’ milk chocolate beverage and ‘Delta’ coffee. My absolute favorite is ‘Pastel de Belem’, you must try it. The owners (a married couple) are actually from Lisbon, and they are part of the charm of this place. If you come by in the afternoon, he will be there to serve you and a nicer guy will be very hard to find. It looks like a small cafeteria from another era: minimalistic, charming, with high quality products and superb customer service. Oh! And totally price friendly. There is a vintage feeling to it that I just love. Only a handful of seats are available as most people have their coffee on the go and take their pastries to go as well. They only accept cash. My first time here was part of my birthday celebrations. Best-dessert-ever. 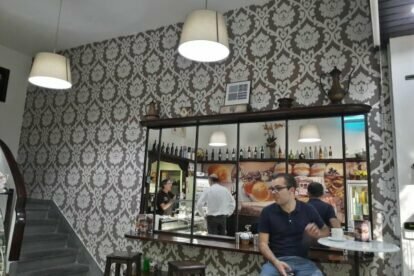 Another time I took some friends that had just been on vacation in Porto, and funny enough, they wanted to keep enjoying the “Pastel de Belem”. A total success. Another time we witnessed a mini movie-set on the street, right in front of our table while having coffee. The scene had a famous actress walking up and down from a bus full of extras, some of which came in for some pastries and drinks. Cannot tell yet if “Pastelería Lisboa” will be in a movie/tv show but here is hoping that it does.